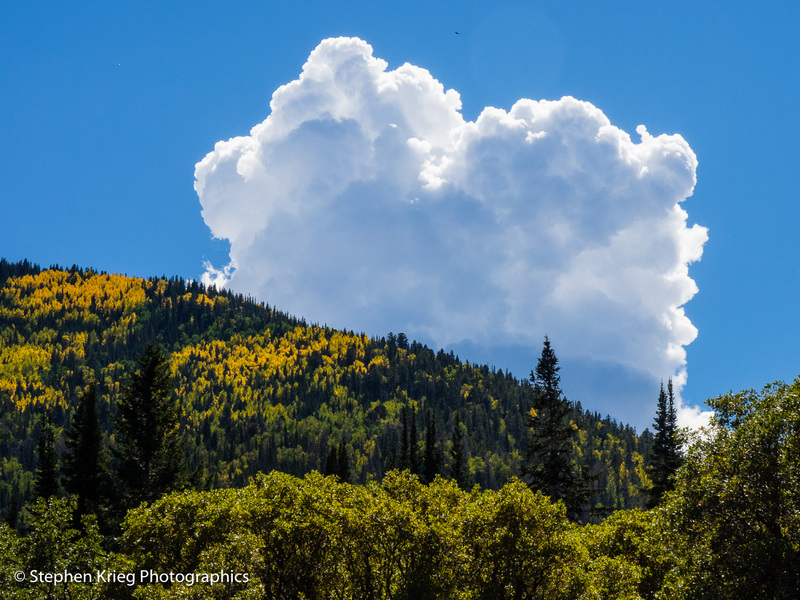 Abajo Mountains, early fall colors. A slow, glorious autumn has been progressing in the Four Corners region. Cool nights and warm sunny days. No big cold snaps yet. I have heard reports of terrible (almost nonexistent) fall colors in much of Colorado, other than the San Juan Mountain Range. The early summer rains — so appreciated for making the region so lush this growing season — was also good for an aspen leaf fungus to prosper. Nothing serious, it’s temporary. But it affects the aspen trees, making them feel like dropping their leaves early. We shall see how this plays out over the next couple of weeks. 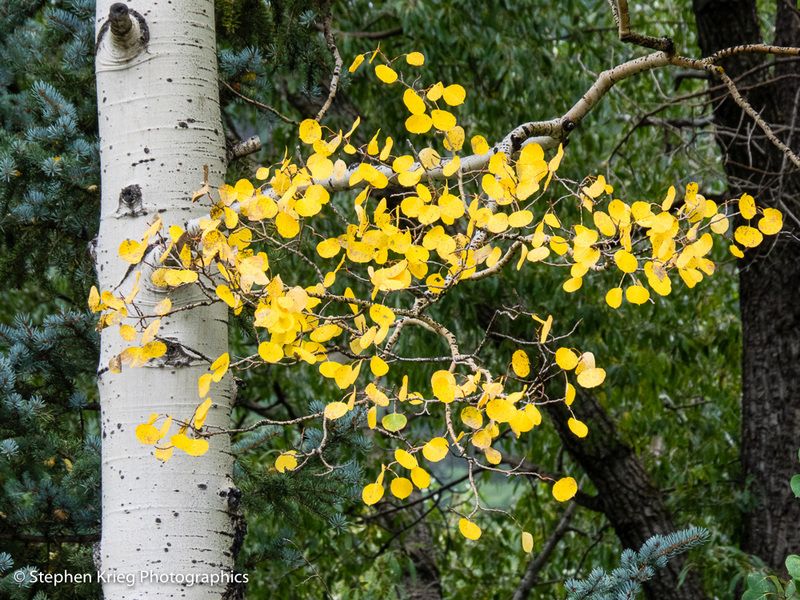 Quaking Aspen fall foliage, Abajo Mountains, Utah. 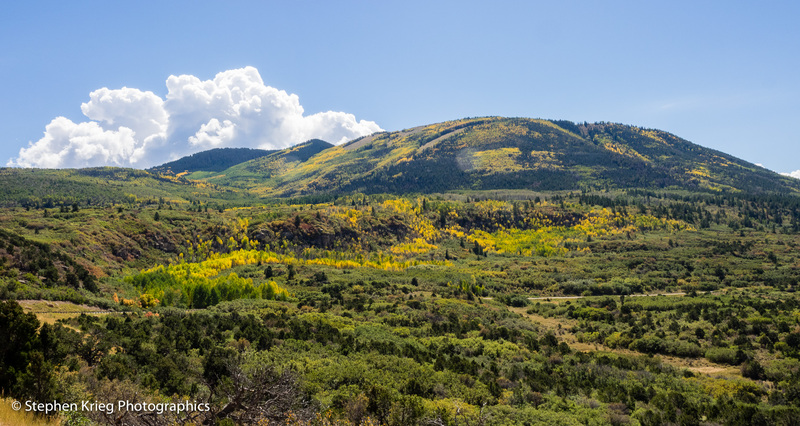 This week I went to the Abajo Mountains, a very small but beautiful mountain range within the Manti-La Sal National Forest just west of Monticello, Utah. The higher forest stands had some nice colors going, especially on the north side of the range. Thunderhead cloud over the Abajos. Afterward, climbing up onto Cedar Mesa, large raindrops splattered my windshield. So I pulled over to get out an enjoy the spontaneous shower, and the gorgeous clouds that produced it. 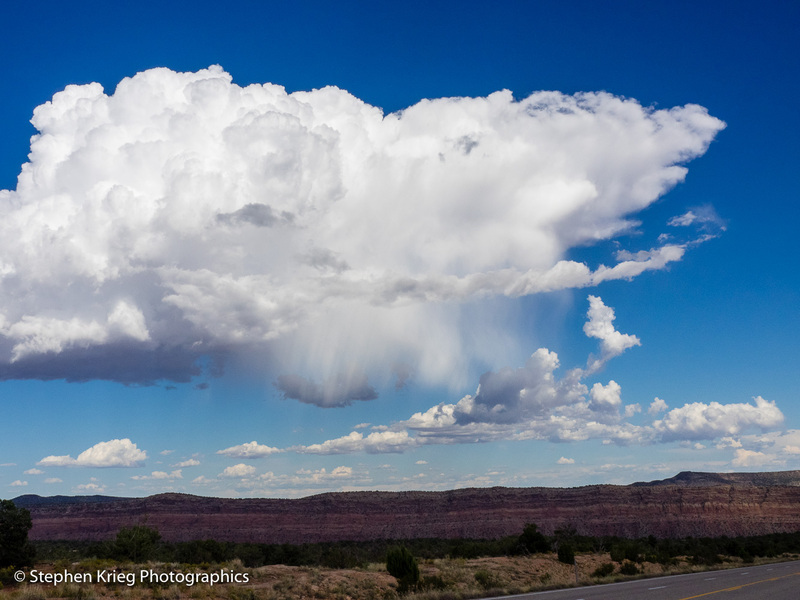 Rain cloud over Cedar Mesa. 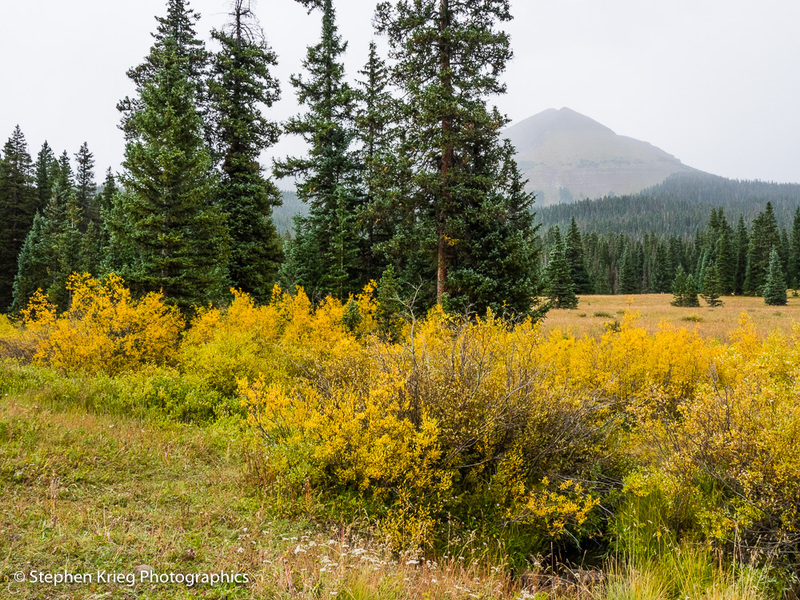 Mountain meadows at Lizard Head Pass, Colorado. It’s the best time of year again: Fall. Autumn. Time for perennial (multi year) deciduous plants to get ready for winter. And for annual (one year) plants to die, having done all they came forth to do in a single glorious season. Streamside willow colors, Lizard Head Pass. In the Colorado Rockies, there’s no better indicator of how things are going in this regard than the high country. It starts up there, and works lower in elevation as October, then November, approaches. And this year has been a banner year in terms of rainfall. It’s been a great growing season, and now the cool nights and warm sunny September days are setting up quite a show of color if it continues like this for two or three more weeks. 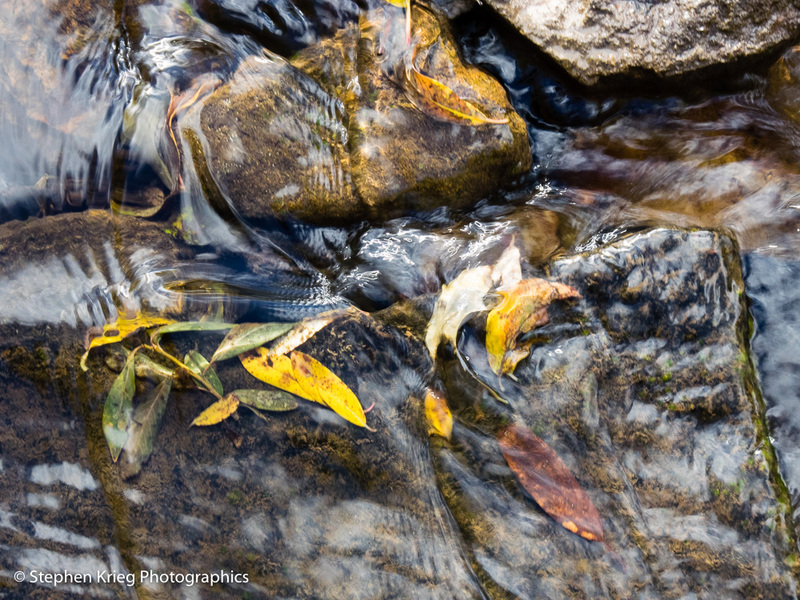 Willow leaves in my campsite’s mountain stream. Why? Because the green in plant leaves is caused by chlorophyll. Interestingly, the green of spring and summer masks other colors in the leaf. In the fall, the coolness of the nights signals the approach of winter. And the trees begin to ease back on the manufacture of chlorophyll. Less green, more other colors, like yellow, gold, and sometimes oranges and reds. Fireweed, Dolores River. 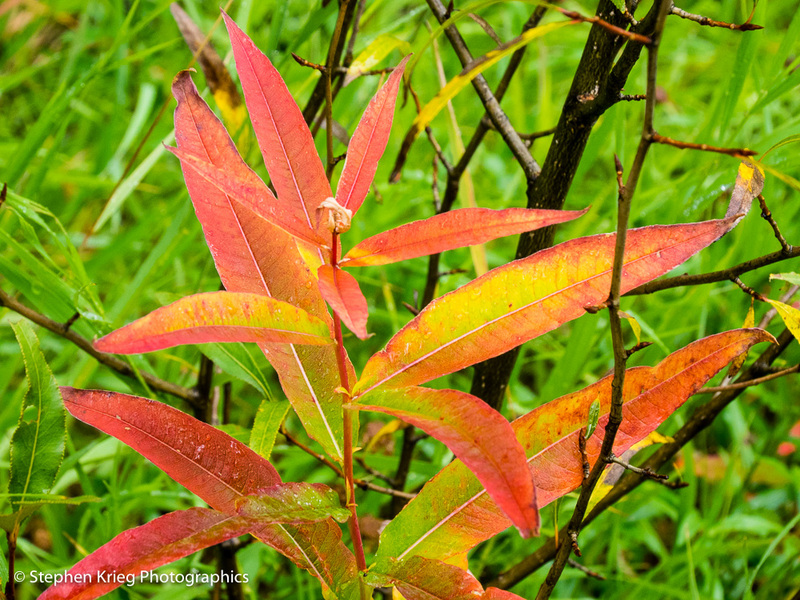 It colonizes burned over areas, and goes out with a blaze of red at season’s end. 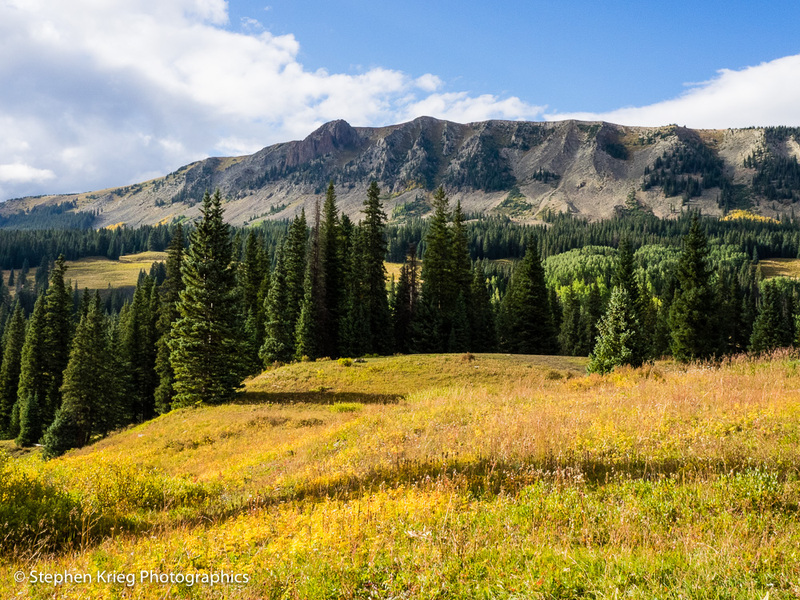 So to see how things might be progressing, I headed up into the San Juan mountain range of southwest Colorado. What was even sweeter was that rain showers were in the forecast. Love those clouds mixing it up! 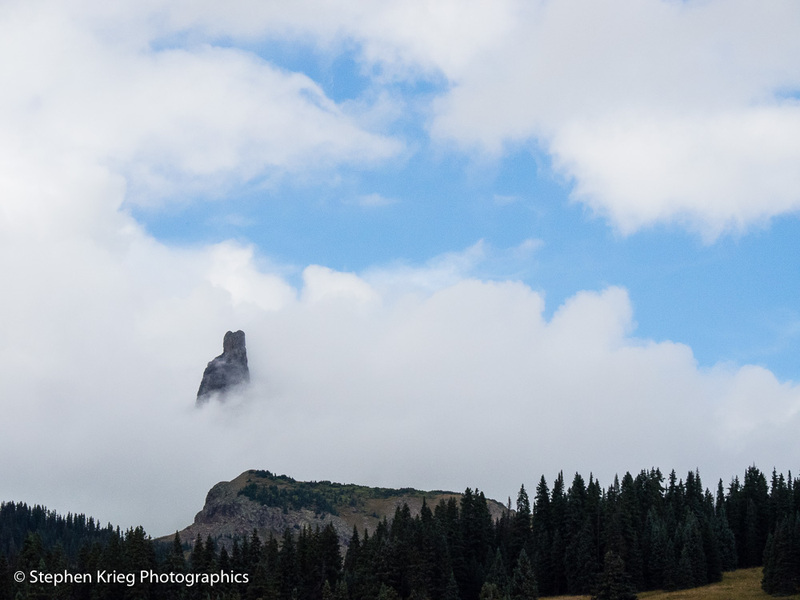 At Lizard Head Pass, I first stopped because its namesake peak was playing peek-a-boo with the clouds. 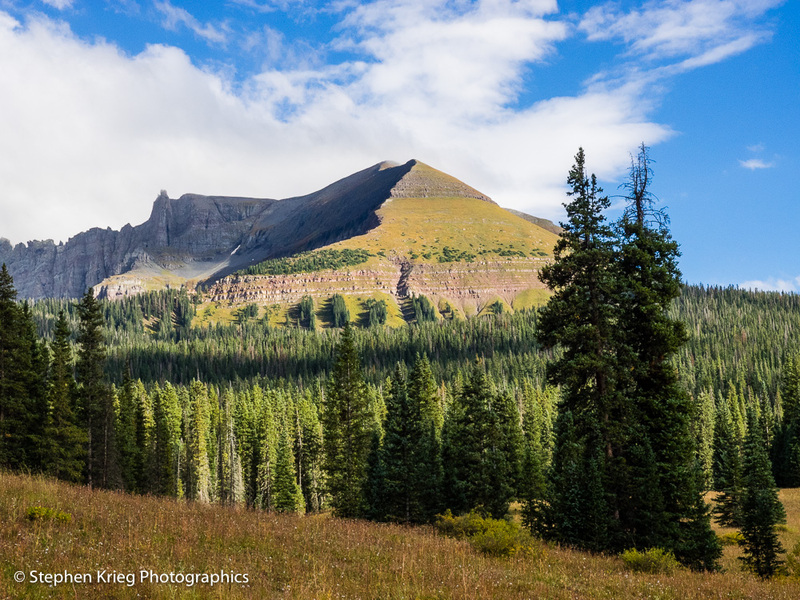 The San Juan National Forest on one side, the Uncompahgre National Forest on the other. The spire of Lizard Head Peak peeking through the clouds. 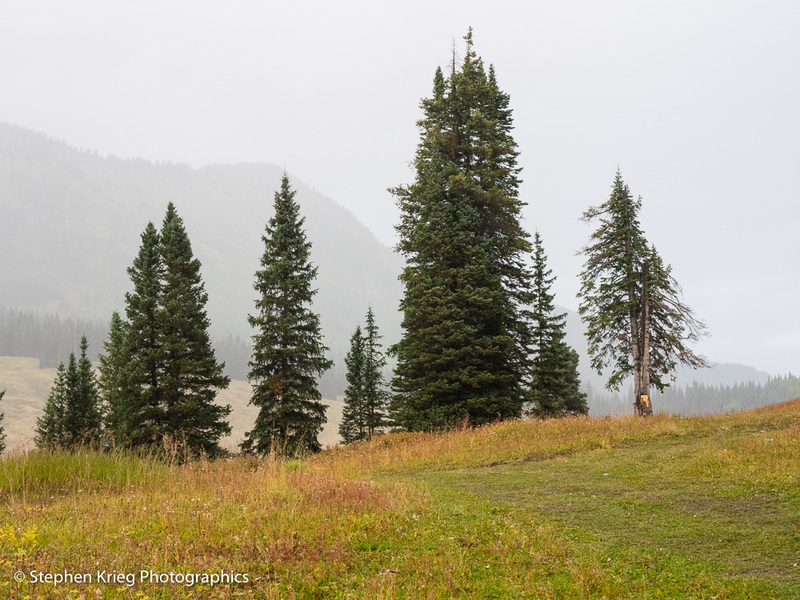 I found a nice campsite in a high mountain meadow below Sheep Mountain. A fine 360-degree view. I was beside a babbling mountain brook. That sweet music. The willows along its banks were already gold. Much more so than the aspen forests, which were maybe 5 percent turned to yellow. However, the tundra up at timberline, and the meadow grasses and forms, were already golden with touches of red. The small plants signing off before the aspen forests would take the main stage. Sheep Mountain, as sunset time nears. Rain showers off and on; more music on the steel roof of my vehicle. At one point before sundown a heavy squall breezed through. It looked more like sleet than rain, but if so it didn’t stick on the ground. Rain/sleet squall livens up the scenery for a while. For fall colors, cool weather is perfect, but really cold weather isn’t. That’s because if there’s a sudden hard freeze, or an early snow, the trees drop their leaves quickly, almost in unison. Thanks for another summer season, they say; see you in the spring. Gotta go. 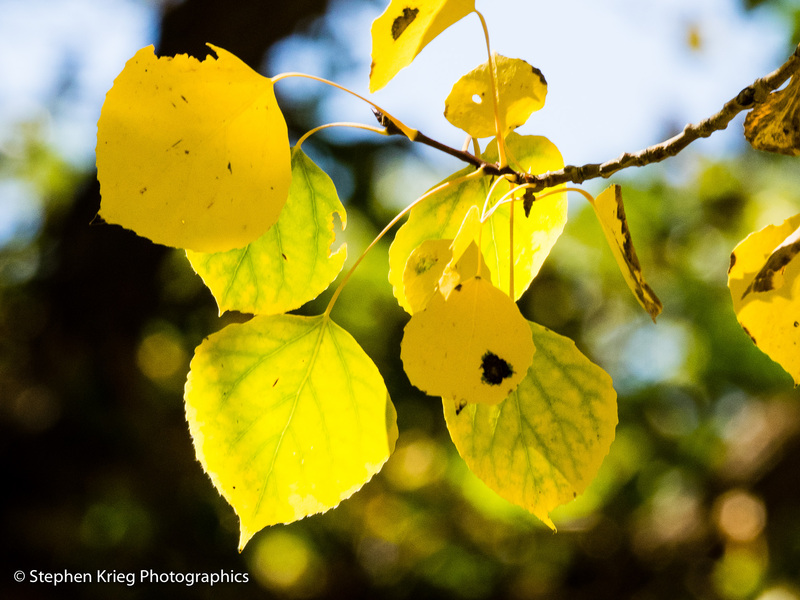 Some aspen colors up close, Dolores River. So I’m hoping this cool but not hard-cold weather lasts for a while. I intend to savor whatever happens, though, week by week. Until the last leaf falls.